Did global warming stop in 1998, 1995, 2002, 2007, 2010? Global temperatures continue to rise steadily beneath the short-term noise. "January 2008 capped a 12 month period of global temperature drops on all of the major well respected indicators. HadCRUT, RSS, UAH, and GISS global temperature sets all show sharp drops in the last year" (source: Watts Up With That). A common claim amongst climate skeptics is that the Earth has been cooling recently. 1998 was the first year claimed by skeptics for 'Global Cooling'. Then 1995 followed by 2002. Skeptics have also emphasized the year 2007-2008 and most recently the last half of 2010. NASA and climate scientists throughout the world have said, however, that the years starting since 1998 have been the hottest in all recorded temperature history. Do these claims sound confusing and contradictory? Has the Earth been cooling, lately? To find out whether there is actually a 'cooling trend,' it is important to consider all of these claims as a whole, since they follow the same pattern. In making these claims, skeptics cherrypick short periods of time, usually about 20 years or less. The temperature chart below is based on information acquired from NASA heat sensing satellites. It covers a 30 year period from January 1979 to November 2010. The red curve indicates the average temperature throughout the entire Earth. The red line represents the average temperature. The top of the curves are warmer years caused by El Niño; a weather phenomenon where the Pacific Ocean gives out heat thus warming the Earth. The bottoms of the curves are usually La Niña years which cool the Earth. Volcanic eruptions, like Mount Pinatubo in 1991 will also cool the Earth over short time frames of 2-3 years. Figure 1: University of Alabama, Huntsville (UAH) temperature chart from January 1979 to November 2010. This chart is shown with no trend lines so the viewer may make his own judgment. 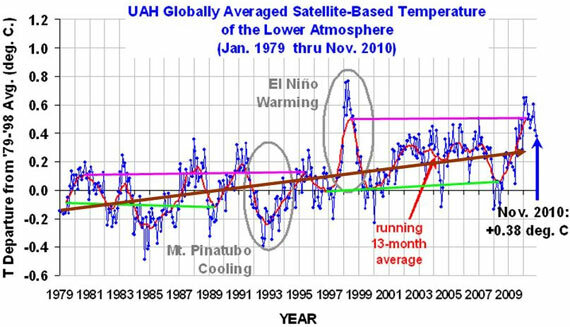 Below is the same temperature chart, showing how skeptics manipulate the data to give the impression of 'Global Cooling'. First they choose the warmest most recent year they can find. Then, in this case, they exclude 20 years of previous temperature records. Next they draw a line from the warmest year (the high peak) to the lowest La Niña they can find. In doing this they falsely give the impression that an ordinary La Niña is actually a cooling trend. 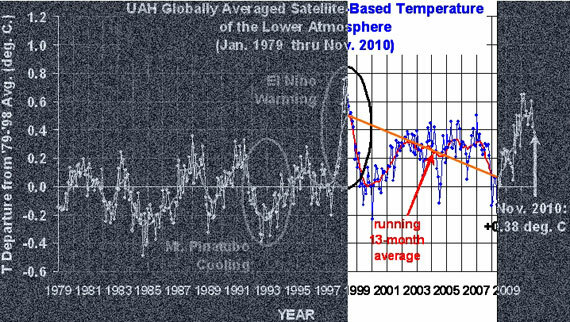 Figure 2: Representation of how skeptics distort the temperature chart. Even though the chart clearly indicates increased warming, skeptics take small portions of out of context to claim the opposite. What do the past 30 years of temperature data really show? Below is the answer. Figure 3: Trend lines showing the sudden jump in temperatures in the 1995 La Niña (Green lines) and the 1998 (Pink lines) El Niño events. Brown line indicates overall increase in temperatures. The chart above clearly shows that temperatures have gone up. When temperatures for the warm El Niño years (pink lines) during 1980-1995 are compared to 1998-2010, there is a sudden increase of at least 0.2o Centigrade (0.36o Fahrenheit). Temperatures also jumped up by about 0.15oC (0.27oF) between the cool La Niña years (Green lines) of 1979-1989 and those of 1996-2008 (the eruption of Mount Pinatubo in 1991 lowered the Earth's temperatures in the midst of an El Niño cycle). The overall trend from 1979 through November 2010 (Brown line) shows an unmistakable rise. In spite of these facts, skeptics simply keep changing their dates for 'Global Cooling', constantly confusing short-term noise and long-term trends (Figure 4). Figure 4: Average of NASA GISS, NOAA NCDC, and HadCRUT4 monthly global surface temperature anomalies from January 1970 through November 2012 (green) with linear trends applied to the timeframes Jan '70 - Oct '77, Apr '77 - Dec '86, Sep '87 - Nov '96, Jun '97 - Dec '02, and Nov '02 - Nov '12. The Argo system, the best data available, is showing no rise in ocean temperatures at all (indeed, a slight cooling) since it was deployed in 2003. This data raises a lot of questions. If the heat isn't in the atmosphere, and it's not in the oceans, where is the Global Warming heat supposed to be? Response: Note that the heat capacity of the oceans is much greater than the atmosphere. So relatively small amounts of heat exchange (from the ocean point of view) make a big difference to atmospheric temperatures. Initial results from the Argo system contained a cooling bias due to issues with the pressure system. The latest results from Argo show warming. This is particularly the case when the results down to 2000 metres deep are considered (the upper waters show more variability while the overall warming trend is more apparent when viewing the 2000 metres heat content). Bottom line - the oceans are still warming. 1. Argo only measures to 2km. Oceans are much deeper than that. 2. If La Nina is bringing cooler water to the surface, you would *expect* that Argo would show a cooling at the surface. "Oceans are much deeper than that." Quite the generalization there. Many are, many are not. Neverthe less are you arguing that all the heat is finding its way to the deep deep depths of the ocean without leaving a trace in the top 2 kilometers? That's quite a sequestration mechanism there! Can you provide me with details? Argo shows an averaged temperture for various zones. You need to look at maps that contain smaller snapshots to see the changes wrought by both El Nino and La Nina. The effect actually begins as a localized cooling (La Nina) or heating (El Nino) along the Peru-Chile (or South American) subduction zone. The change in ocean surface temperature over the zone causes changes in both ocean currents and wind direction* (*towards the Andes mountains or away from them). This type of phenomena is not restricted to El Nino/La Nina but occurs in lesser degrees all around the "Ring of Fire". Since these changes in the subduction zone are reflections of what is occurring in the mantle it follows that the tidal movements in the mantle are the actual cause of a very strong climate driver. As we know that tidal effects are heavily influenced by gravitational pull of large extraterrestrial objects we can show that there is significant climate forcings from our neighbors in the solar system. To what degree remains a question. See the arguments in "Its the Sun" for references. You may recall that I had mentioned that the solar activity causing changes to the magnetic field rang a bell but I cound not put my finger on it. Well I just did in my last comment. It is starting to come together. The heat transferred in an El Nino is from the earth itself, indirectly through the ocean. It's a form of vulcanism known as a subduction zone (see comment 4). Ok over the last 10 years the temperature has cooled slightly, or stayed about the same, or maybe even warmed slightly. But whatever the real outcome, the assertion that we are going through a radical period of accelerated warming and are on the verge of a climactic catastrophe (tipping point), sounds very very dubious a statement indeed... but isn't this the concept that inspires all the work that goes into a website such as this? Response: Personally, the inspiration for this website is not about catastrophes or end of the world stuff. I'm more concerned about the incremental changes that will and are impacting society - decreasing food production in low latitude countries which are least able to adapt, decreasing water supply which will only be exacerbated over time. Sure, there is some hysterical doomsday alarmism out there (from both sides). But for those lacking the foresight to care about the world they hand over to future generations, this is something that will effect us now and over the next decade. As a skeptic I find this site the most open minded of all the climate blogs I have visited, especially when compared to our American sites. I find the links and graphs especially useful and highly recommend this site to others who often comment on the web. If the La Nina is moving cooler water to the surface, then it stands to reason that warmer waters are moving to the depths. Is there a flaw in my reasoning? Logical assumption. The upwelling flow, warm or cold, effects ENSO and the Air currents, hence weather and climate. The resulting flows within the ocean I have not looked into but it would be interesting to know. Anyone? If I were to chose a collarobator to make a discovery, I might choose you. Open minds tend to prevail in science. What I see that is difficult about understanding the climate is that there appear to be 10 variables, all dependant on the others. In basic Physics, theories are easy to test because there were only a few variables, all easily measured and constrained. No such situation exists with climate and weather. The complexities are more like String theory or Chaos theory. And, Quiteman, you are correct about the sites. Most sites are more Political Science, that science. "But for those lacking the foresight to care about the world they hand over to future generations, this is something that will affect us now and over the next decade." Are we debating science or philosophy? Facts or wishful thinking? "What is happening and how it may affect the earth" and "Do we want this to happen" are two different issues depending on whether you are human or not. As soon as you ask a question like that you move from 'hard' sciences to Behavioural sciences to How I Feel About Life And All That. Not science. There are probably thousands of lifeforms out there only too happy to see CO2 levels going up with the temperature. Others that don't. Where did we get the right to decide what the future of this planet and it's associated lifeforms should be? From just being the 'dominant' species? We talk about the kind of planet we want to hand down to our descendants but nobody has put up a specification as to what that might be. And if you did, there will be a load of people disagreeing with you. Change will happen, with or without us burning off fossil fuels. The real question is Will there be a catastrophic event as a result of our activities and How do make sure we survive it? Just as we have had to find ways round the problems our ancestors gave us, so will our descendants have to do the same. If we can make it easier for them, fine. But our basic imperative is to make sure man as a species survives. Isn't that what evolution is all about? You make some very good points. Unfortunately if we are correct in our argument for natural causes there are no "fixes" and this whole carbon (CO2) issue will ruin the industrialized world as we know it. It is already having a very damaging effect on several countries. QM: I understand the quandary we are facing; if AGW is a reality then unchecked it will have disastrous consequencies for us all. Equally,trying to control AGW effects ( unless you limit controls to the more advanced nations) will inevitably have just as serious consequencies for developing nations. So who decides who gets hurt? So I see both scenarios as compelling reasons to get the science right before taking any action. "When in doubt, do nowt", or as I think you said in another post..."doing nothing is an option"
Industrialised societies as we know them will end if we do not develop viable alternatives to fossil AND nuclear fuels simply because we will run out of them sooner or later. That seems to me to be a much greater ( and certain) problem than whether we survive a few degrees rise in temperature. Yes life might be a bit more difficult and unpleasant, but survivable by just about everybody. A global industry collapse ( with war as a precursor)will probably not be survivable. I don't believe doing nothing is an option. While I doubt we will run out of fossil fuel for along time yet, the cost of extracting it is increasing while the demand for it is also increasing rapidly. So doing nothing and sticking your head in the sand is not really a bright idea. And why should anybody think that employing alternative forms of energy will cause the world's economies to crash? Surely doing nothing is going to cause that much more quickly? Running out of fossil (and Nuclear) fuel is a certainty. BUT before we ever reach that point - however far away that may be - an energy 'war' will start,( arguably has already started)and it will escalate as the energy required to extract these fuels approaches the energy derived from them. Concerns about the effect of a slight rise in temperature over the next century and the consequences thereof are irrelevent in this context: our civilisation will survive the predicted global warming scenario, it will not survive if we do not develop alternative energy sources that are independant of fossil fuels. Running out of fossil fuel is a certainty. Reserves of fuel on current usage will run out in a few hundred years if "Green" movements continue to restrict drilling in "sensitive" areas. I am probably wrong but I often wonder where all this fossil fuel came from. Back in my school days (35 years ago) I was taught that is was from the Dinosaur days. The Earth was much hotter, Plants grew much lusher ( More CO2) . There was abundant Plant life that grew and died and rotted in swamps eventually forming Oil. This will not happen today. This planet is cold. It has been 11,500 years since the last Ice Age. The next Ice Age is due. We need millions of years of heat and increased CO2 to give the Earth a fighting chance. Where is the evidence that the next ice age is due? This 'slight' rise in temperature could be enough to raise sea levels by seven metres just from Greenland alone in the next hundred years. Even in 2008, 634 million people live within 10km of coasts. Do you see that as irrelevant? The next ice age can not begin until after the current one ends. We ARE IN an ice age, Ice Age 4 known as the Neogene-Quarternary Ice Age. This is an interglacial period within the confines of Ice Age 4. In other words this is colder than normal and slowly returning back to earth normal (hot). Before you ask what is normal, you should know that all 4 of the ice ages only constitute about 10% of the earths history (but a much higher percent, maybe 40%, if you only count from the beginning of life). That means that 90% of the earths history (or about 60% of its inhabited history) is a HOT earth (but habitable despite extremely high CO2 levels ay times). The information is available at both government and university sites. I suggest becoming familiar with the scientific terminology at these sites and then look at the graphs of paleoclimates. The alarmists like short terms, 30 years rather than say 50 or 100 and for paleoclimates no more than a few hundred thousand years rather than millions because it makes AGW look pronounced and they can't account for high temps and low CO2 or low temps with high CO2 because it does not fit their models or their agendas. In the context of the survival of civilisation, yes I do see it as irrelevent. That does not mean I am not concerned! Bubonic plague killed over half the population of Europe in the 14th century (estimated 35 million people) and a quarter of the worldwide population. The population in Europe recovered within a century. The 634 million you mention represent 10% of the world population so the effect of that 7 metre rise ( even if it killed them all) would have less effect on civilisation than the bubonic plague. The timescales are roughly the same..100yrs, the difference is that we have the ability circumvent the effects of rising sea levels so the net outcome will not threaten civilisation. It depends on what your perpective is, survival of the individual or survival of the species; marked global cooling would be a lot more difficult to survive than the equivalent level of global warming. Mankind in general ( and politicos in particular) is often very myopic when it comes to 'proving' a current view is THE right one. It is interesting to note the shift in emphasis from Global Warming to Climate Change. You can't argue against one of these...guess which? You are correct, the overall slope is negetive. I am referring to the current slope of the past 5 million years as positive. "Climate change is a lot less frightening than global warming". "It's now 2006...I think that most people would conclude that there is global warming taking place and the behaviour of humans is affecting the climate..."
....and third, if one considers that it is appropriate to misrepresent and deliberately misunderstand the science in pursuit of political agendas, one might consider who is actually benefitting from one's contrived misrepresentation...one might discover at some future time that one was being treated as a chump to service someone else's agenda! That's incorrect. The overall trend of the last 5 million years has been a mildly cooling one. There's no such thing as "normal" temperature in relation to the Earth. The Earth is on a journey through time, and it's properties (atmosphere, temperature, biosphere, geology and so on) evolve according to a whole range of intrinsic and extrinsic factors. For human kind and the current biosphere, "normal" only really has a meaning in relation to evolutionary adaptedness. The biosphere in its current state is adapted (i) to the relatively cool period of the last several million years, and (ii) to a world with rather more continuous and connected environments that has, until the recent past, allowed migration as a fundamental means of adapting to climate change. "Alternatively, Camp 2007 adopts an empirical approach to calculate solar influence on global temperature. He determines the solar cycle contributes 0.18°C cooling to global temperatures as the sun moves from maximum to minimum. Employing back of a napkin calculations, TSI would need to fall roughly 4.3 W/m2 to provide 0.6°C of cooling." Isn't this what the graph shows? Lows of around 1360.25 to highs of 1363.5...roughly 3.25W/m2 or around .45C of cooling? (ii) The Earth's surface temperature response is damped, and it comes to equilibrium much more slowly than the few years "allowed" for it to "track" the solar cycle variation. So the tracking of the Earth's temperature response to the solar cycle is continuously "frustrated" (very much like the temperature response to a thermostat). The atmosphere follows the solar cycle most faithfully. The ocean and land surface is much slower to respond. So the effects of the solar cycle is damped, and the entire effect of the solar cycle is to contribute around 0.1 oC of temperature difference at the Earth's surface, between the solar maximum and solar minimum (Tung considers that the solar cycle contribution is a bit larger...around 0.18 oC). If the solar cycle were to stop and the sun emit solar radiation equivalent to 1363.5 W/m2 for a long period (say 30 years to come close to equilibrium)...and then the sun switched to a constant TSI output equivalent to 1360.25 W/m2 for 30 years to establish the new equilibrium temperature, the temperature difference at the Earth's surface would be your 0.45-ish oC of cooling (all else being equal). ..but these temperature changes in response to forcings are equilibrium changes..
Chris, I'm not sure I accept your view of solar cycle 'damping'. The annual response to orbital & axis fluctuations (which are basically the same as increasing/decreasing TSI) is quite rapid, even for large masses of water. I live on the coast and the seasonal fluctuation in sea temp is quite pronounced and predictable...peaking at around 27C and dropping to around 17C in the summer/winter cycle. These seasonal fluctuations are much greater than the solar cycle and I suspect the small warming of the solar cycle gets overshadowed somewhat rather than retarded. Yes there's no doubt that the effects of the solar cycle are "overshadowed" by internal variations in the climate system. After all the peak to trough surface temperature variation between the solar cycle max and min is around 0.1 (maybe as much as 0.18) oC. Since year on year variation in the Earth's temperature anomaly can easily be 0.1 oC, the solar cycle doesn't really show up in the surface temperature record without efforts to deconvolute this. In general we expect the sun to contribute a little cooling during the solar minimum and a little warming (supplementing greenhouse gas warming) around the solar max. "The Eastern U.S. Keeps Its Cool While The World Warms"
ScienceDaily (Jan. 31, 2001) — Much of the Earth has warmed over the last half-century, but the eastern half of the United States has shown a cooling trend. NASA-funded research indicates cooler temperatures in the eastern U.S. are caused by an increase in sun-shielding clouds produced by warmer ocean temperatures in the Pacific. But naturally, local observations are much better than instrument readings (it only took 30 years to catch up with what we all already knew). Next they can explain the cooler temps in southern CA. I'm very new here but can you tell me if in fact the cooling referred to at the start of this post "2007's dramatic cooling is driven by La Nina which historically has caused similar drops in global temperature and should recede in mid-2008" actually happened? I find it difficult to reconcile the various conflicting opinions but it seems the prediction that warming would recommence in mid 2008 is not borne out by reality as 2008 was overall quite cool. Was the prediction that warming would start again in mid 2008 from computer models? If so it seems to reinforce the findings that modeling predictions don't agree with the subsequent actuality.. The temperatures in early 2008 through May were highly suppressed (except oddly for March). Temperatures recovered in the second half of the year so that the last half of 2008 was as warm as the second half of 2007. And 2007 was one of the top three warmest years on record. Overall 2008 will be cooler due to the cold start. Despite that it's one of the top 10 warmest years on record. It is my understanding that methane traps heat only while forming its hydrate and can hold up to 400 degrees F in each and every molecule and its ignition continues without melting the ice which it encompasses. Is there not a serious threat from these hydrates both in the warming deep sea and permafrost that would contribute to global warming since methane hydrate is 20 to 30 times more dangerous as an absorber of heat than CO2? Is it likely that this coming Spring, as it warms and the hydrates that have formed during the winter start fighting to survive the warmer weather, they will dissociate especially in Russian, Canadian and Scandanavian permafrost? https://www.llnl.gov/str/Durham.html gives a brief outline of methane hydrate properties which are totally different to methane gas - which I suspect you are confusing it with. I am confused. Watts claims that there has been cooling and you suggest to attack that but all you do is explain that cooling and so confirm it. Also that prediction that cooling would end somewhere in 2008, did that come true? Response: There's no denying there's been cooling in the last few years - that's an observed, empirical fact. What needs to be done is understand the cooling in the broader context. The earth has an energy imbalance. More energy is coming in than is coming out. The planet is gradually accumulating heat and hence showing a long term warm trend. But superimposed on this long term trend is short term fluctuations such as the El Nino pattern and solar cycle. Both of these cycles are in strong cooling phases at the same time - a cooling perfect storm if you will. Re cooling subsiding in 2008, La Nina did subside and then flipped right back into strong La Nina conditions again (see graph in the next comment). Thus demonstrating the difficulties in predicting short term ocean cycle variability. As for the sun, many peer reviewed papers examine the link between sun and climate. They all note that the sun has showed little to no trend since the 1950's and hence has had a minimal contribution to global warming over the past 4 decades. I second Theo's question - is there updated information available on the most recent temperature trends and whether La Niña has been receding in the last year (since mid-2008, that is). Does anyone have any current information indicating one way or another? Hi, to evrybody. I'm new on this 'very-well-done' site. I'm italian and not a great english speaker/writer, but I'm sure you fine people will forgive me. I just want post a question on this arcticle. I read in it that to cause a chute of 0.6 degrees it need a 13 W/m2 fall of TSI. OK, so far so good. This other article say "The correlation between sun and climate ended in the 70's when the modern global warming trend began." So, if i understand, before 1970 the sun was the cause of climate variation. And in the graph i see that (before 1970) a variation of less than 1 W/m2 causes a temparature increasing of almost 0.4 degrees. It is not that a contradiction? The sun was not necessarily the primary cause of climate variation before 1970. In fact, the forcing from solar variation is not particularly large. The breakdown in correlation is just to show that the sun cannot be the cause of global warming in the last few decades. Another possibility that in effect alters TSI is albedo. The earth's albedo is not constant and is dominated by cloud cover. Increased cloud can warm or cool the earth depending on the type and altitude. More high level cloud increases the albedo but traps more heat resulting in warming. More mid-low level cloud increases albedo but relects more radiation causing cooling. Goode & Palle (2007) suggest small changes in albedo produce changes in radiation levels over twice as high as GHGs. Charting albedo from 1985 to 2004 shows an interesting correlation to GMT. Albedo declines some 3% from 1984 to 1995 and drops fast (by another 8%) between 1995 to 1998 where it is at a minimum.....and 1988 was of course a very warm year. Since then the albedo has increased ( albeit hesitantly)by 4% up to 2004, which is possibly a major factor in the present downtrend in GMT. All the of the global temperature metrics, GISS, UAH, HadCrut etc say that temperature rises are NOT being balanced out, and overall temperatures are rising. Continued from comment here by Norman. "The interesting thing about the GISS anomaly map above is the choise of base=line (1951-1980). This was a relatively cooler period of time and to use that to show Arctic warming may distort what has recently been going on. I went to the GISS page ... GISS Arctic temp map using 2000-2010 as the baseline. " A baseline needs to be a long time period -- its supposed to represent an average condition, so that anomalies are relative to that average. Your 10 year baseline doesn't accomplish that. It is interesting to choose an historically relevant baseline and look at the relative anomalies. Prior to 1946, carbon emissions were increasing at a steady rate; however, after WW2, carbon emission rates exploded. So much so that the cumulative CO2 emissions from fossil fuels after WW2 virtually eclipses all CO2 emissions in the prior 150+ years (you can verify this with data and graphics readily available at CDIAC). So 1900-1946 is a relevant baseline period. Here is the anomaly for 1970-1980. Here is the 1980-1990 anomaly. Fast forward, here is the 2000-2010 anomaly. Look at the numbers in the upper right hand corner, which are the estimated global means for the period mapped. It's obvious that warming rates dramatically increased in the '80s, nearly 4 decades after the rapid increase in CO2 emissions began. Considering that it takes time for the warming effect of CO2 to be fully realized (see the 40 year delay thread) that result is not surprising. Response: [DB] Your images aren't showing up anymore (and the links don't work so I no canna fix 'em). [mc] Aargh - should work now. "Given the widely noted increase in the warming effects of rising greenhouse gas concentrations, it has been unclear why global surface temperatures did not rise between 1998 and 2008"
Are they aware of the exceptionnaly warm 1998-niño-year flaw in their decadal trend ? If Kaufmann and co-author's findings are validated by other research, it's not good news. Sulfate aerosols have a short atmospheric lifetime, and when the Chinese stop pumping out all that extra sulfate pollution, it's going to unleash some warming. And yes they have to at some point, for health reasons and to prevent Ocean Acidification. I agree and I don't contest its interest, but the presentation (title/abstract) of the study sounds like a communication deal to me, like if they were perfectly aware of their decadal flaw (part of the answer about this apparent stagnation is in the question), but made this deliberated choice to promote their work... and some media titles confirm this feeling : "Chinese coal pollution halted global warming !". No worries Papy. I'm just finishing up a post on Kaufmann 2011 - let's say my take is a bit different. Shows over, folks. No warming here, nothing to see. Sniff sniff . . . I smell a penguin BBQ.